As always, last but not least is our look at power, temperature, and noise. Next to price and performance of course, these are some of the most important aspects of a GPU, due in large part to the impact of noise. All things considered, a loud card is undesirable unless there’s a sufficiently good reason – or sufficiently good performance – to ignore the noise. Having already seen GM204 in action with the GTX 980 series, we have a pretty solid foundation to base expectations on for the GTX 970. GTX 970 should offer reduced power consumption at reduced performance, and with EVGA’s open air cooler this card will never hit 80C, so if it is ever throttled it will be entirely by TDP and not by temperatures as was the case with GTX 980. We’ll start as always with voltages, which in this case are in-line with what we have already seen with GTX 980. At 1.218v for the card’s maximum boost bin, the GTX 970 is only a step below the GTX 980 in voltages. We sometimes see these cards binned to operate at lower voltages for power saving purposes, though with GM204’s already low power consumption I’m not sure how necessary that is from a product development standpoint. Next up, let’s take a look at average clock speeds. 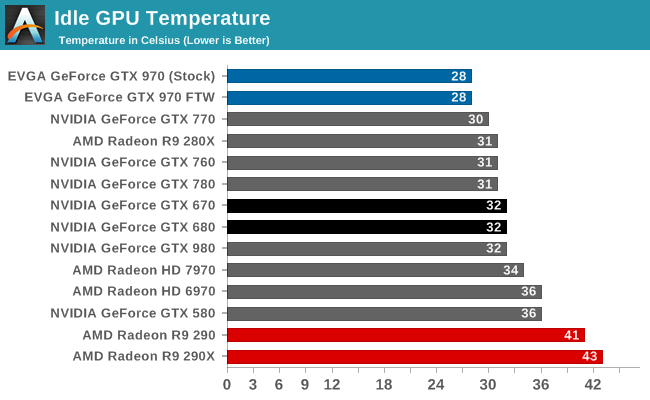 Despite not being temperature limited, what we can see right away is that regardless of the clock speed settings it uses, the GTX 970 FTW is TDP limited under all scenarios. At no point in time are we able to maintain the card’s top boost bin, and instead the card spends its time fluctuating between the boost bins it can hold while maintaining power consumption of 145W. The actual drop off from the maximum boost bin depends heavily on the game; some games average clock speeds close to the maximum, while others have to pull way back. 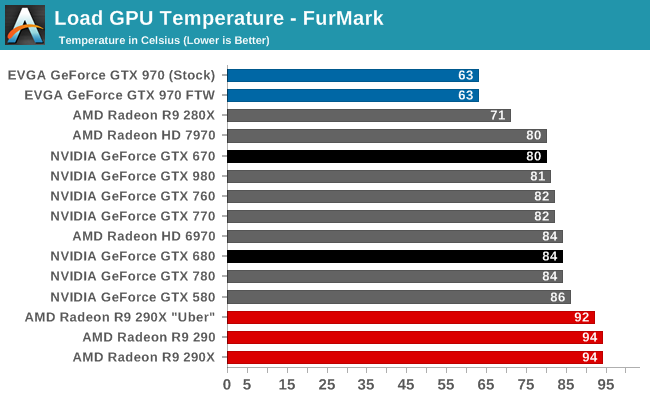 Overall the GTX 970 FTW is a bit more TDP limited in its factory overclocked FTW configuration than its reference clocked configuration, as higher clock speeds draw greater power levels even though voltages are constant. Otherwise we find that in the FTW configuration the card is on average clocked 138MHz higher than the reference configuration, which isn’t quite as high as the 166-189MHz difference in their official specifications. In other words, the FTW’s performance advantage is equivalent to a 140MHz overclock. Moving on to power and starting with idle power consumption, the GTX 970 FTW does not fare quite as well as the GTX 980. Despite having fewer SMMs lit up, EVGA’s card draws a consistent 3W more at the wall. In lieu of other data it’s difficult to determine exactly whether this is due to chip-to-chip variation or EVGA’s board, but the latter explanation is more plausible at this moment. Load power consumption for GTX 970 follows the same path as the GTX 980, almost down to the watt in this case. The GTX 970 FTW actually sees slightly higher power consumption at the wall, while reducing it to reference clocks brings down the power consumption to a flat 300W. Since we are underclocking a factory overclocked card I’m not going to read into the underclocked results too much, but for the FTW we’re looking at power consumption similar to GTX 980 but not quite the performance to match. 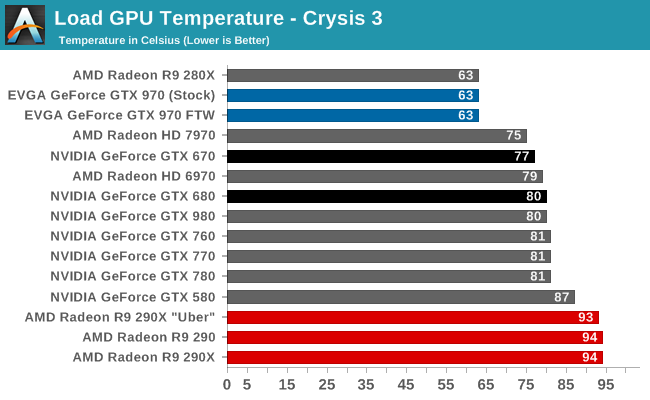 This is likely thanks to the GTX 980 operating a bit under its TDP due to thermal throttling. 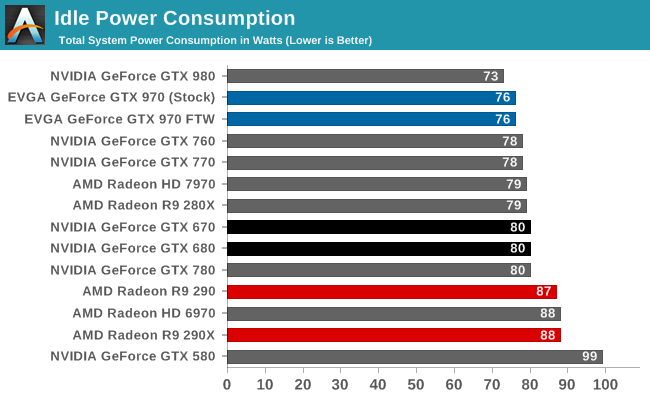 Still, GTX 970 FTW remains as one of the lower power consuming cards of anything in our lineup. 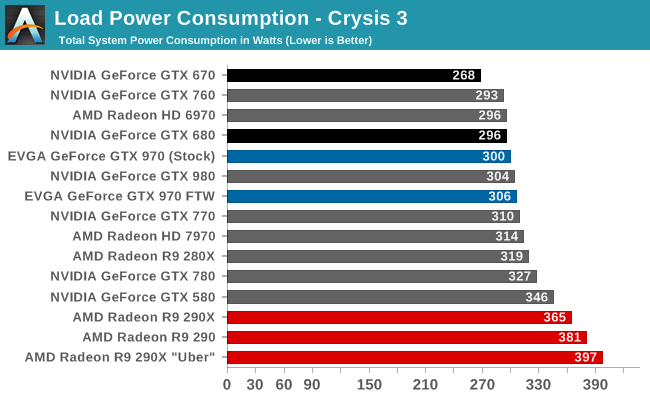 Similarly performing cards such as the GTX 780 and Radeon R9 290XU (which is virtually tied on performance here) clearly draw more power, significantly so in the case of the latter. The story is much the same with FurMark. Since this a purely TDP limited scenario the GTX 970 FTW configuration draws 284W at the wall regardless of the clock speed settings used. 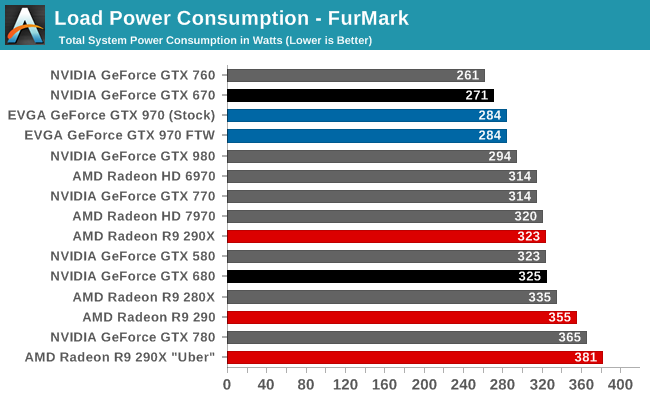 In this worst case scenario power consumption is 10W less than the GTX 980 at the wall and 71W less than AMD’s R9 290. Meanwhile since the GTX 970 is TDP limited under all gaming workloads, in this case this is not a bad proxy for overall power consumption while gaming. While idle power consumption didn’t quite top the charts, idle temperatures do. At 28C the GTX 970 FTW is barely above room temperature. Owing to its open air cooler, low TDP, and TDP throttling, the load temperature for the GTX 970 FTW tops out at 63C in all scenarios. Whether it’s gaming or FurMark, 100% TDP means the card finds its cooling/temperature equilibrium at nearly 20C less than its thermal throttling point. In this case since this is one of the only open air coolers in this lineup – the only other card was the R9 280X – this means the GTX 970 FTW tops the charts thanks to its design. We’ve already covered the pros and cons of open air coolers many times before, and when it comes to temperatures this is a definite pro. 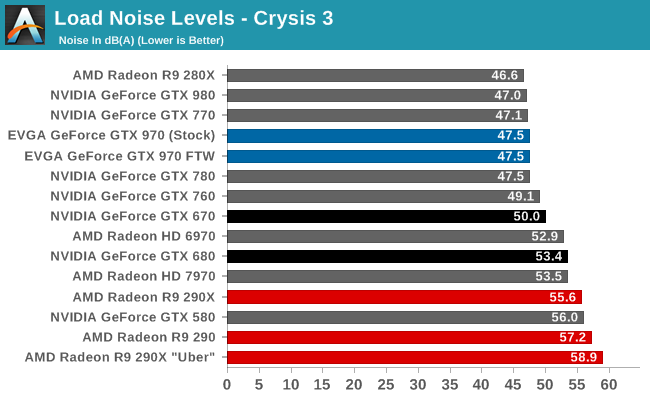 If there is an Achilles heel for the GTX 970 FTW then it is idle noise levels. EVGA’s ACX 2.0 cooler just doesn’t idle very well; even at its minimum fan speed, it still pushes enough air to push the sound meter to 42.7 dB. At this noise level the GTX 970 FTW is not in terrible shape, but near-silent at idle it is not. As it currently stands this card is not going to be a great choice for users looking for a system that can idle with little noise, especially compared to some of the 38dB cards we’ve seen over the last year. This I suspect is why EVGA is looking into changing their card over to using passive cooling at idle. If EVGA can successfully pull off that modification and turn off the fans when idling, then they will resolve the card’s one true weakness and go from the bottom of this chart to the top. Truth be told, even load noise levels aren’t all that impressive here. 47.5dB is still near the top of our charts, but the GTX 980 of all things ended up being ever so slightly quieter. Which perhaps more than anything else goes to show just what that $550 price tag is paying for when it comes to cooling. Without more GTX 970 cards it’s hard to place EVGA’s card among its true competition. But given what we’ve seen previous 150W cards do in the past, it’s safe to say that EVGA is running a bit loud at both idle and load for the amount of heat they have to remove. I suspect the ACX 2.0 cooler used here is a bit oversized for a 145W card, which is similarly reflected in the low temperature results. Given the kind of power they have at hand, EVGA could likely do better with a more conservative fan curve. Looking at the broader picture, while EVGA may not do well against other open air coolers, they are going to do well against most other blowers here. 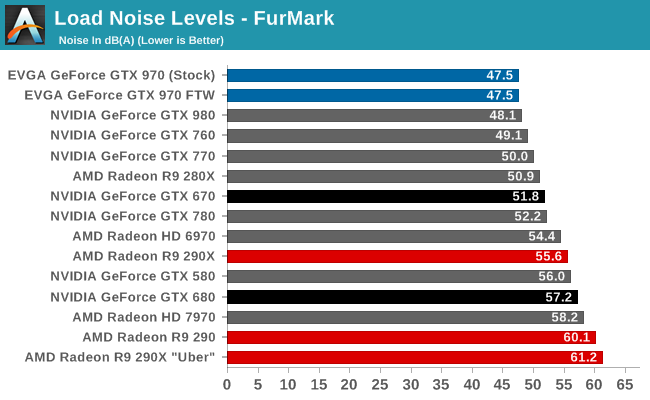 Even the GTX 670 is louder, with a 2.5dB difference in EVGA’s favor. When it comes to FurMark the GTX 970 FTW goes to the top of our charts, but it remains within a stone’s throw of the GTX 980. 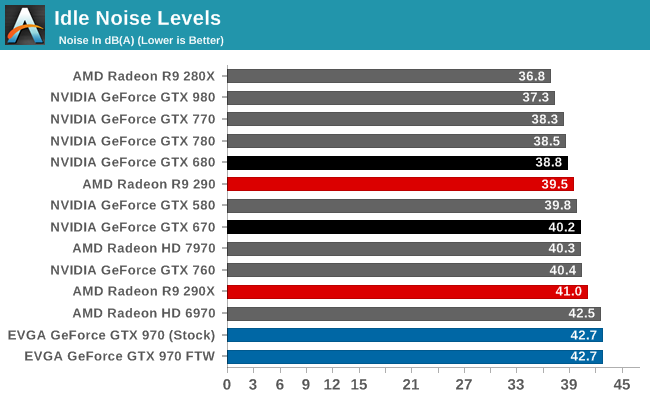 Overall the GTX 970 FTW is a bit of a mixed bag. 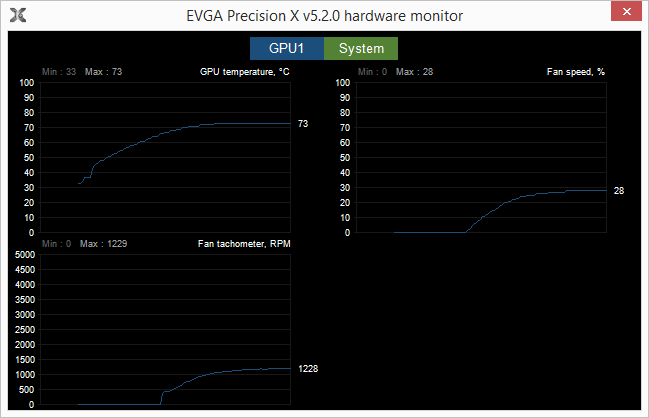 EVGA’s aggressive fan curve and ACX 2.0 cooler produce some amazing GPU temperatures, even for a 145W card. On the other hand EVGA’s noise levels are simply so-so for an open air cooler, with EVGA benefitting from most of the competition in our charts being louder blowers. To be clear it’s still a solid performance and 47.5 dB for the second fastest single-GPU card on the planet is incredibly quiet. I don’t even have to throw in an R9 290XU comparison to make that point, though that card is AMD’s closest competitor from a gaming performance standpoint. Still, I only wonder how well other open air coolers could do in this situation given what we’ve seen from other cards in the past. If nothing else, perhaps we’ve been spoiled by the GTX 980 and its top-tier blower. Update 9/26: Though EVGA missed the initial cut-off for this review, later in the day they turned in an beta/engineering version of their upcoming vBIOS with the zero fan speed idle changes worked in, along with a new fan curve. We can confirm that the zero fan speed function is working in this BIOS, rendering the card silent at idle. Overall EVGA is keeping the fans off until about 63C, at which point the fan controller starts ramping up the fans until it finally supplies enough power for them to kick in. Even under a max TDP load (FurMark) the fans are up and running by 67C. At the same time EVGA’s new fan curve has adjusted their equilibrium point from 63C to 73C. At max TDP load our card now tops out at 73C, which corresponds to a fan duty cycle of 29%, or 42dB. This new curve places the fan load noise levels at less than the previous curve’s idle levels, and now makes this one of the quietest midrange enthusiast cards we have ever reviewed. For the time being this BIOS is still under development (and is subject to change), with EVGA telling us that their goal is to release it to users in the “coming weeks.” Since this BIOS is still in development and not available to the public we will not be changing our official results, but it certainly warrants a proper second look once EVGA ships this BIOS. Is it really safe to overclock the memory like that when there aren't any heatsinks on them?